Features: Donner Ski Ranch Tahoe provides the classic family owned ski resort experience that is quickly disappearing in California, with affordable rates and a family-friendly environment. Located conveniently off the historic Route 40, the resort is an easy day trip drive from the bay area, and about a 15-minute drive to Truckee. Why We Go: For an old school feel that stays true to the heart of skiing and snowboarding, Donner Ski Ranch Ski Resort keeps things simple but effective. Non-intimidating Environment: With less advanced and expert skiers on the scene at Donner Ski Ranch Ski Resort, beginners can feel at ease and comfortable with learning and falling frequently. Weekday Specials: On Tuesdays, Wednesdays and Thursdays, an adult full-day pass is only $25. This awesome deal is hard to beat at any other resort in the area. Tubing Hill: When your knees are about to give out and your rear end just can't take any more falls, but you're not quite ready to head home yet, the tubing hill at Donner Ski Ranch Resort Tahoe is a godsend. Besides being ideal for the little ones, you'll be surprised how much fun you can have flying down the hill clutching a rubber wheel. Inside Knowledge: Parking is free at Donner Ski Ranch Ski Resort, a stark contrast from hiked up prices at many nearby resorts. Do Enjoy the View: Visitors going up the ski lift at Donner Ski Ranch can enjoy spectacular views of Donner Lake and the surrounding mountain ranges. Do Bring the Whole Family: Affordable rates for lift passes and lessons combine with an ample array of beginner slopes to make Donner Ski Ranch Tahoe a great fit for all ages. Don't Go Multiple Days: In comparison to some of the other slopes, Donner Ski Ranch Norden has fewer slopes and peaks by nature of its smaller stature. To keep things fresh, check out different resorts on different days instead of staying at Donner for the entire weekend. Don't Confuse the Resorts: Located only one mile away from Snow Bowl Resort, many tourists have mistakenly entered the wrong resort. Because the two cater towards different niches, make sure you read the signs correctly before hitting the slopes. 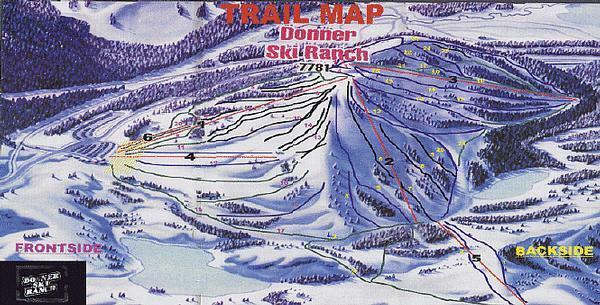 Donner Ski Ranch Tahoe is one of the last family-owned and operated ski resorts in California. Located on top of Donner Summit on historic Route 40, Donner Ski Ranch Tahoe boasts a relaxing and carefree environment. Donner Ski Ranch Ski Resort is a non-intimidating and ideal location for beginners and learners of all ages. Donner Ski Ranch Tahoe offers a Tubing Hill on the side as well for those who prefer not to ski or snowboard. The Donner Ski Ranch Ski Resort offers lessons for all ages, at reasonable prices. A $66 adult beginner package includes a lift ticket to chairs four, six and the magic carpet, as well as rentals and a group lesson. Packages are $62 for young adults and $52 for children ages 7-12. Private lessons are also available for $70 per hour, which does not include rentals or a lift ticket. Private lessons are the only lesson type for children under the age of seven. Donner Ski Ranch Norden offers on-site rental packages for both ski and snowboard, as well as helmets. Six ski lifts service the slopes, with one of them a triple chair lift. The Donner Ski Ranch Bar & Grill is also open for dinner. Ski and snowboard rentals are available on-site in the main lodge, with different pricing for adults, young adults, children 7-12, and children 6 and under. Helmets are also available for $7 (all ages).